The rising cost of health care was the top issue on the campaign trail in Minnesota this year, and the new governor and state lawmakers expect to continue the conversation when the new legislative session starts in January. 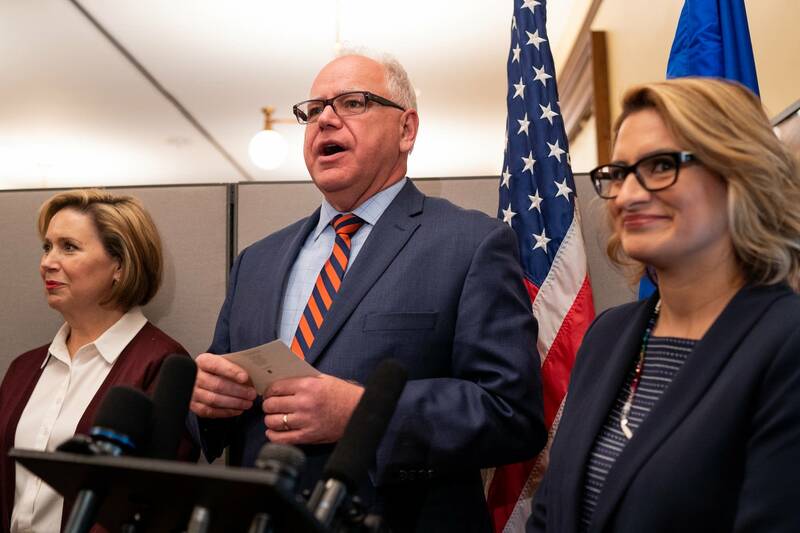 For DFL Gov.-elect Tim Walz, that means looking at giving Minnesotans the option to buy-in to a public insurance program known as MinnesotaCare, and he could get some support from new DFL House members. But the buy-in option is not the same as a single-payer system, even though they were often discussed in the same breath on the campaign trail. And the idea could face significant pushback from the Republican-controlled Senate. First off, what is MinnesotaCare? In 1992, Republican Gov. Arne Carlson and legislators teamed up to create MinnesotaCare, a state-subsidized health insurance plan to cover low-income, Minnesotans who work but don't qualify for Medical Assistance, the state's version of Medicaid. The program covers many of the same things as Medical Assistance, including doctor's visits, hospitalization, prescription drugs and therapy services. To qualify for MinnesotaCare, enrollees must be residents who fall within a certain income threshold. Enrollees pay monthly premiums to the state based on their income and family size. The size of the program fluctuates, but as of June 2018, 88,305 people were enrolled in MinnesotaCare. So, how would a MinnesotaCare buy-in option work? The idea behind the buy-in is to open the program to everyone on the individual insurance marketplace — but the details matter. Outgoing DFL Gov. Mark Dayton has been pushing a version of the buy-in that would lift income restrictions on MinnesotaCare and allow anyone buying insurance on the marketplace the option to choose "MinnesotaCare Buy-In." Under his plan, people who elect the buy-in option would pay monthly premiums for their coverage. Walz has been open to a similar plan. In 2017, the Dayton administration estimated his plan would cost an average of $469 per person per month, or $69 per month less than the average paid by Minnesotans for commercial health plans. But a different plan, proposed by DFL state Sen. Tony Lourey, would allow a buy-in option only in regions of the state where there have been "market failures." That means areas where there aren't more than two health care providers. This targeted approach had support from at least one Republican senator, Scott Jensen, who signed on to the bill. "I look at the buy-in as a place where the public sector needs to step in and fill in where markets aren't working for people," Lourey said. "That's what's really attractive to people who aren't served well by existing marketplace. They look to the public to help fix some of the things that aren't working." Republicans pushed back against the buy-in on the campaign trail, arguing it would hit doctors hard because MinnesotaCare pays them less than commercial insurers do. For the same reason, Republicans said rural hospitals and clinics could pay the price for a public option. Minnesota hospital groups have also opposed the idea. "If hospitals are continually being underpaid for their ongoing costs and they start to collapse or have deficits, how long is it before they come back to the state and ask to borrow money for equipment?" asked Sen. Michelle Benson, R-Ham Lake, the chair of the Senate Health and Human Services Finance and Policy Committee. Benson she said she's reluctant to hold a hearing next session on the MinnesotaCare buy-in bill. How is the buy-in option different from single-payer health care? The MinnesotaCare buy-in option is often talked about in tandem with a single-payer system, but they are not the same thing. A single-payer health care system is one where there's a single entity — the government — that provides coverage for all residents. The MinnesotaCare buy-in proposal is not mandatory or the only option. It would be one selection available to residents on the individual market. Walz has said he's open to a single-payer system in the future, but only if the federal government is on board. But is this a precursor to a single-payer system? That's certainly how some lawmakers view the buy-in option. Benson said offering a public option means anyone, including those with employer-sponsored insurance, could drop their plans for the public option. "Eventually this does lead to single payer," she said. "Once our insurance market is gone it's not going to come back." How much would something like this cost taxpayers? MinnesotaCare, which administered nearly $350 million in health cares services in 2017, according to House Research, is funded mostly by the federal government, with help from premiums paid by individuals as well as a 2 percent tax on providers that's due to expire after this year. Lawmakers will debate next session whether to extend the tax. The Department of Human Services says the cost is closer to $397 million when other spending is factored in. The cost associated with a buy-in option would all depend on how the program is constructed. Dayton estimated a one-time startup cost of $12 million to get the program running, but he said the rest of the cost would be covered by premiums paid by Minnesotans participating in the buy-in. Others, including Benson, are skeptical of that figure, especially after issues the state had starting up MNsure, the state's health insurance exchange. Lourey also cautions that some sources of federal funding aren't a guarantee, especially if dramatic changes are made to the program. Have any other states implemented something like this? Other states are looking into a buy-in option for Medicaid. New Mexico, for example, has formed a working group to implement a buy-in option in several phases. At least 14 states are exploring their options, said Allison O'Toole, the former head of MNsure who now works for United States of Care, which advocates for buy-in proposals around the country. And there are other states, such as Wisconsin, where Gov.-elect Tony Evers campaigned on a "BadgerCare" program, she said. Has there been any public polling done on this issue? 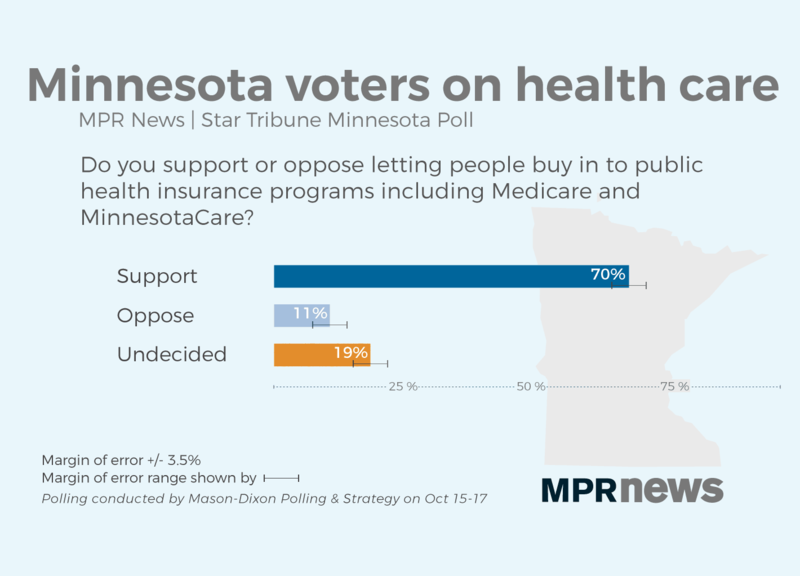 In October, an MPR News/Star Tribune poll showed that a strong majority — 70 percent — of likely Minnesota voters support letting people buy in to public health insurance programs, including Medicare and MinnesotaCare. Eleven percent said they oppose the idea, and 19 percent are undecided. Support for the idea was widespread in every region in the state and with every age group. It was also supported across party lines: 82 percent among Democrats, 63 percent among Republicans, and another 63 percent among independents. "The bottom line is that the public wants reform and is demanding it," O'Toole said.